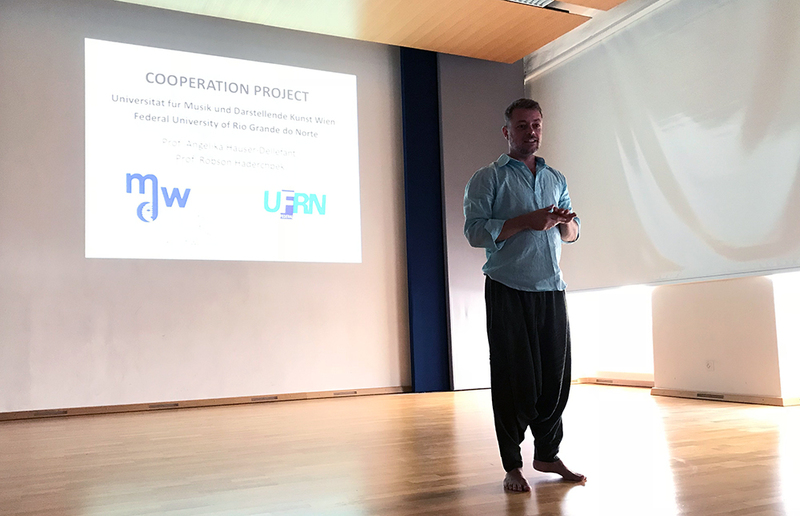 Seit Jahren pflegt das Institut für Musik- und Bewegungspädagogik/Rhythmik (MBP) sowie Musikphysiologie einen fachlichen Austausch mit der DART (Department of Art) der UFRN Natal/Brasilien. Eines der Partner-Projekte wurde im Dezember 2015 abgeschlossen, ein neues Projekt wurde für 2018/19 genehmigt. 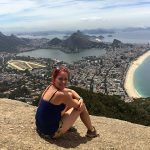 Darüber hinaus ermöglichte ein Kooperationsvertrag zwischen den beiden Universitäten einer Masterstudentin, das Wintersemester 2016/17 in Natal, Brasilien zu verbringen. Wie kommt es, dass eine brasilianische Theaterausbildung mit dem Institut MBP zusammenarbeitet? In Brasilien wird die traditionelle europäische Theaterform mit der Kunst der reichen, weißen Oberschicht und damit auch mit dem Kolonialismus assoziiert. Sie wird daher von vielen BrasilianerInnen mit Skepsis betrachtet. Neue, eigene Theaterformen entstanden und entstehen durch die Auseinandersetzung mit den Quellen der eigenen Kultur und durch den Austausch mit anderen südamerikanischen Staaten. In Brasilien haben sie oft Bezüge zu den Mythen, die aus der Verschmelzung dreier Kulturen – der portugiesischen, schwarzafrikanischen und indigenen – entstanden sind. Sie beinhalten immer auch Tanz, Gesang und Musik. Der Kontakt zum Publikum ist direkt, und ein brasilianisches Publikum erwartet dies auch. Daher finden die Aufführungen in einfachen großen Sälen oder im Freien statt. So ergibt diese Art, mit Performance umzugehen, ein äußerst interessantes Spannungsfeld zur europäischen Theatertradition. Da auch MBP/Rhythmik mit Bewegung, Stimme, Gesang, Musik im Bereich Improvisation und Performance arbeitet, bot sich eine Kooperation an, die sich in der Folge als sehr inspirierend für beide Seiten herausstellte. Im März 2018 kam Dr. Robson Haderchpek im Rahmen eines Erasmus-Aufenthaltes wieder nach Wien. 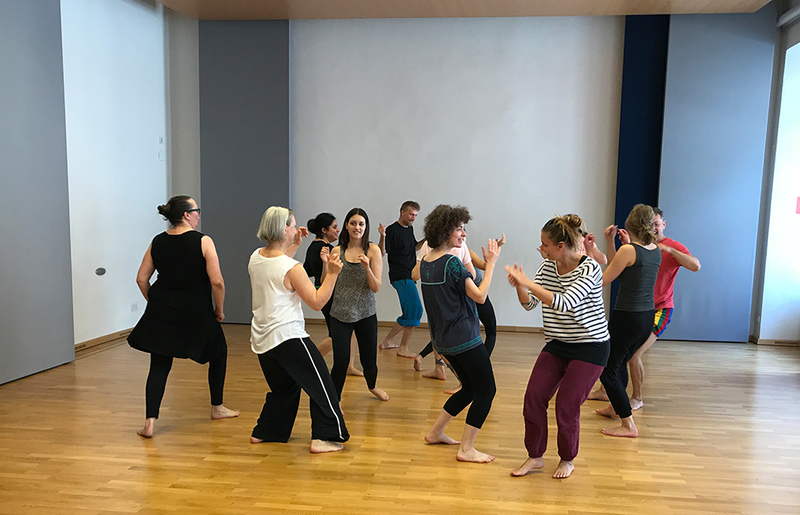 Er gab einen für die ganze mdw offenen Workshop und auch mehrere spezifische Workshops für die Rhythmikstudierenden. Außerdem hielt er einen Vortrag über die bisherige Zusammenarbeit mit dem Ausblick auf das nächste Erasmus+ Projekt. 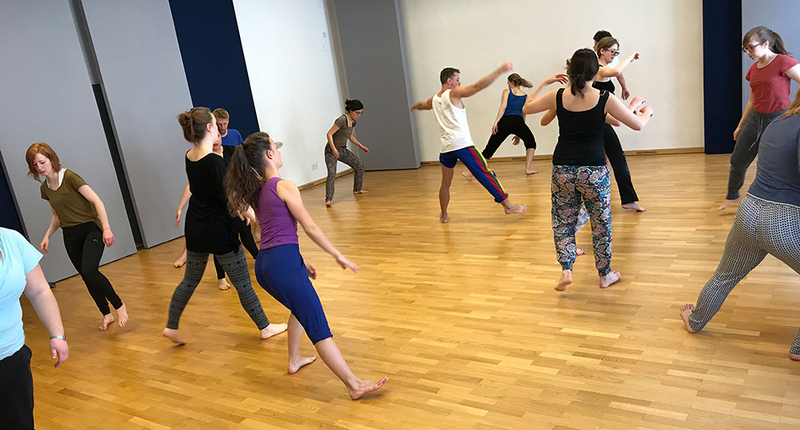 During the whole week we worked about the theme “Poetics of Elements: movement, music, theatre and performance in the tradition of brasilian culture” and we developed a lot of exercises and practices having as guides the four elements: earth, water, fire and air. The workshops and the lecture were open for all students of the Department of Music and Movement Education/Rhythmics and Music Physiology. The students could follow also the workshops of the other years. 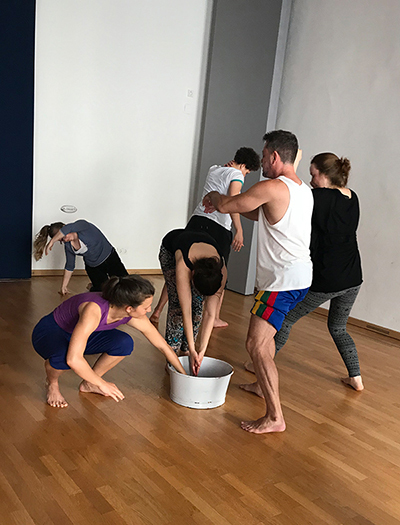 At the first workshop (earth) which was accessable for all students of the mdw we worked first with the elements to try them out in the body. Later we developed the creative process with an image. Each person had to choose a personal image to start the “Ritual Play”. In the first part we did the observation and in the second part we transfered this image into a body moving through the space. 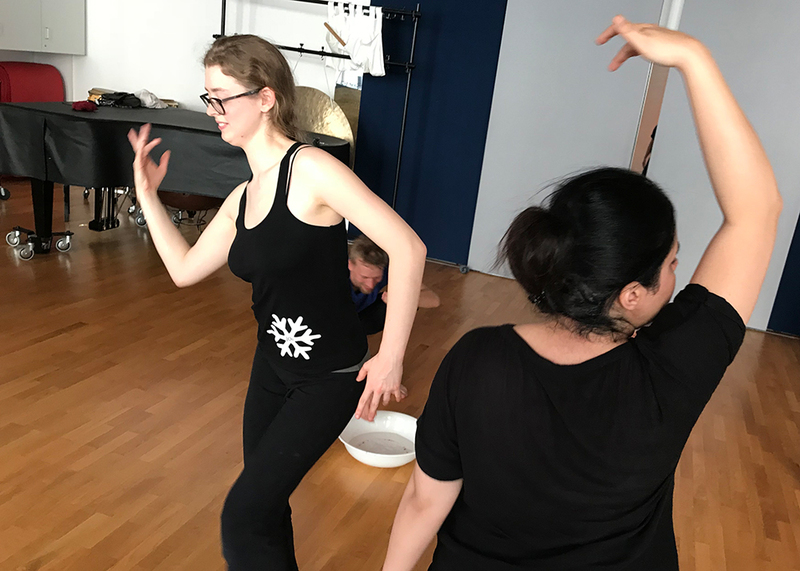 In that moment we could bring back again the energy from the elements (water, earth, air and fire) and we could try new ways and new relationships during the play. We have a version from this music in Portuguese, but we sang in English, so it was easier to include everybody. In the class of water we worked mainly with emotion. We put the attention on our chest and danced with the energy of the water. On that day we used basins with water, and it was very beautiful to see the relationship from the group with the real element. They touched themselves and created a good atmosphere. 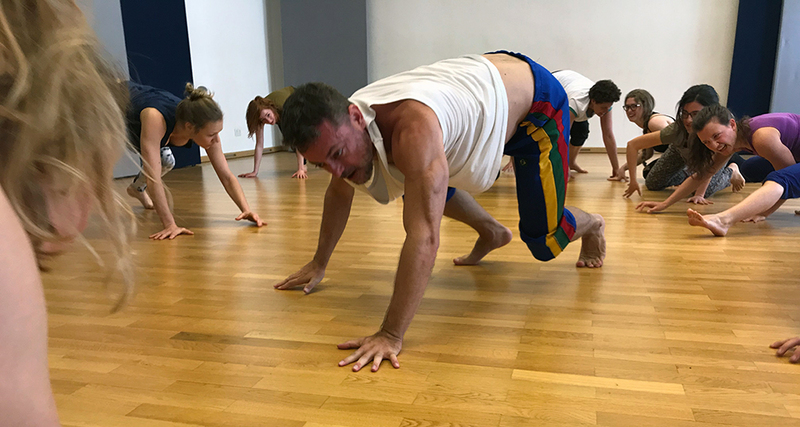 In our fire’s class we stimulated the hips and woke up our inner fire. We worked with the image of a snake and let the movement grow up in the spine. We developed the dance of the fire in pairs exchanging the energy, giving and receiving hugs. After this we did the “game of the panthers” putting the attention in the whole group and waking up our perception to the attacks. We worked with the fire from the war and the fire from the passions. We finished this day with a tribal music from Brazil. In the class from the earth we worked with the foot putting the attention in our primitive instincts. We smelled each other, we fought, danced and celebrated the life. We worked specially this day with the “roots” and with the animals (lizard, lion, tiger, monkey and bulls). At the second part of the class we did a game with the sticks in the circle creating a good atmosphere of cooperation between the players. We finished this day dancing “Coco de Roda”, a specific dance from Northeast of Brazil. 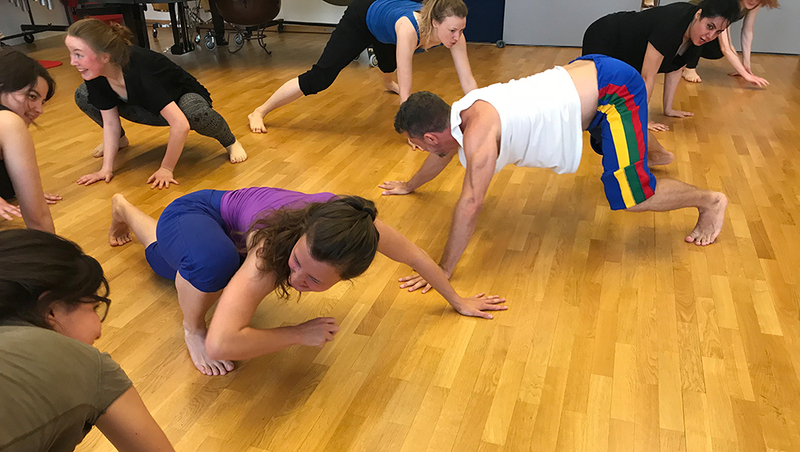 In the air’s class we developed a special work with the breath opening the lungs and letting the air enter in our body with more attention. We concentrated the work in our shoulder blades and created “wings” to fly. We became birds and “flew” together through the space. We worked also with imagination using the body like a balloon and like a dry leaf. For to finish we danced and sang together “The Dance of Winds”. In the class with earth and water we worked with some parts of the exercises described above, making a mixture between the two. It was very interesting to see how the students tried to work both. In the class with the musicians we did a mixture between all elements and we could try each one in one way. 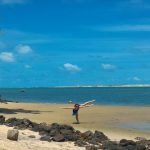 We started working the earth, using a little bit of the “capoeira”, afterwards we went to the water, opening the chest and working with the emotions. The third was fire, we woke up the hips and danced with the passions. We finished the work with the air, discovering our birds and flying together. 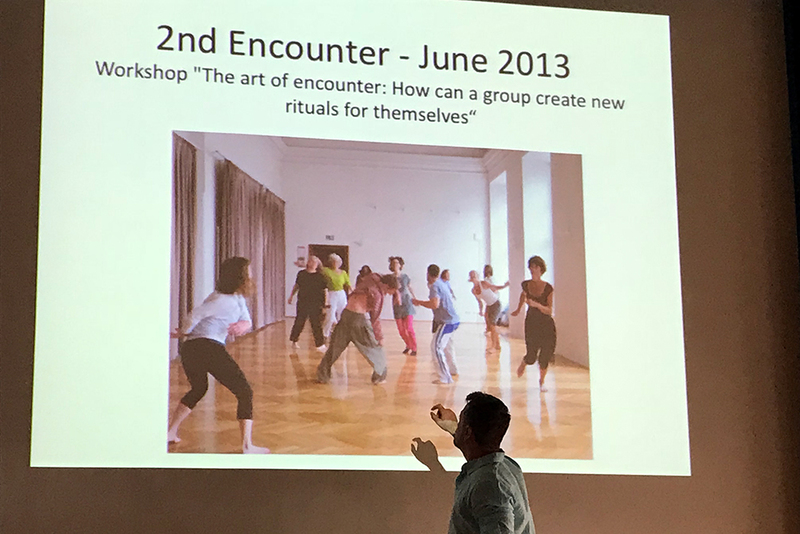 About the lecture, Professor Angelika-Hauser Dellefant and me presented the theme “Ritual and Performance” and we explained how the cooperation grew from the first meeting in the IDEA Congress in Belém/PA – Brazil in 2010. 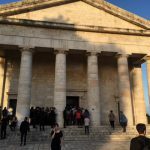 We did a short contextualization about the encounters of teachers and students of the two universities. 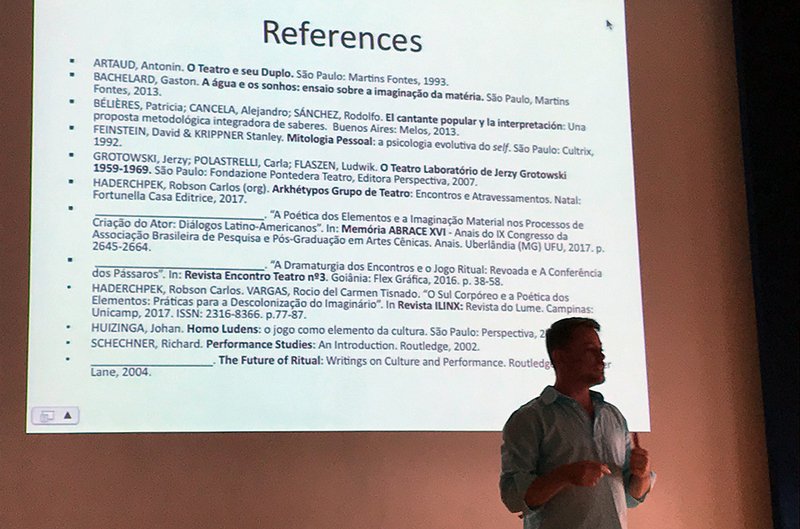 I showed also the movie about the last Cooperation Project and I talked some words about the theatre group “Arkhétypos Group” and the “Poetics of the Elements”. On Friday Angelika Hauser-Dellefant and me discussed the new project and created a schedule to the next encounter that will have a part in Vienna/Austria and another part in Natal/Brazil. 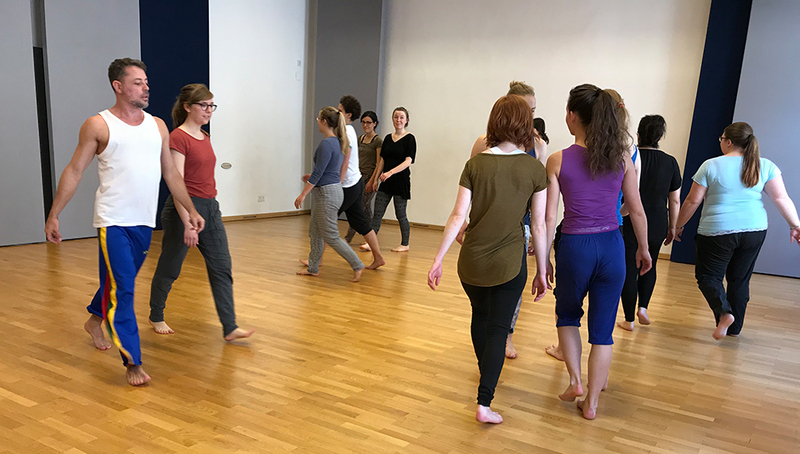 For me it was a big pleasure to come to Vienna and work with the amazing students and professors of the University of Music and Performing Arts Vienna. leitet das und unterrichtet am Institut für Musik- und Bewegungserziehung sowie Musiktherapie.